Launching his financial career in 1986, Jeff founded Grand Wealth Management in 2004 to help people make smart decisions about their money. As an advisor who thrives on tending to details that others may gloss over, Jeff keeps a close eye on both the particulars as well as the broad view to address families’ most stubborn financial complexities. Prior to founding Grand Wealth Management, Jeff was a principal with Ernst & Young for 18 years. 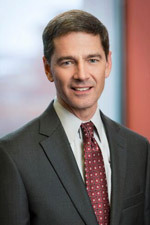 He served as director of Personal Financial Counseling Services for the firm’s West Michigan practice, and director of Investment Advisory Services for the Lake Michigan Area (including Chicago). In this capacity, Jeff oversaw more than $475 million of client investments. A seasoned financial planner, tax professional and investment manager, Jeff is regularly quoted in local and regional media. He also has been a guest speaker for statewide groups including the Michigan Association of Certified Public Accountants, the Western Michigan Estate Planning Council and the Estate Planning Council of Northern Michigan. As he and his wife transition into the “empty nest” phase of their lives, Jeff still enjoys spending time with family, as well as traveling and improving on his golf game.